It’s 1981. You’re playing PAC-MAN at the local arcade. And, for the 38th time that day, you die. The familiar falling sound prompts a familiar action: You reach into your pocket, and feed another quarter to the machine. Chances are you weren’t actually playing PAC-MAN in 1981, but some people who were went on to form the modern game industry. And some 30 years later, those old arcade aficionados discovered a lesson in their own history: during a frustrating moment, such as a loss in the middle of a win streak, many people will pay. This became a foundational lesson of microtransactions. The concept is called loss aversion, and it applies to many interactions in freemium mobile games. Fail too many times in Candy Crush Saga, and you can either wait or pay. When your base is wiped out in Clash of Clans, again, you either wait or pay. Longer wait timers even function as a loss: got 10 hours until your rutabagas ripen? Wait, or pay up! But old wisdom is not always the best wisdom. In ad-monetized games, particularly those with rewarded video ads, loss aversion isn’t the best method for earning—or making your players happy. Freemium game designers have been in a battle with frequency distributions since the dawn of their industry: IAP can only succeed if it interrupts gameplay infrequently. Unlike ’80s arcades, where most games cost a quarter, players today can choose from a massive range of games with different pricing structures—so if they feel pushed to pay, they leave. In fact, loss aversion only works on a small group of players: on average, only about 2% of players ever make a purchase. And out of that 2%, most only ever make a single purchase. Rewarded video ads are the polar opposite. While the average IAP purchase is measured in dollars, even the highest-earning rewarded ad view is measured in cents. Companies can get away with selling IAP once; conversely, it’s impossible to succeed if most of your users only watch a mobile ad once. 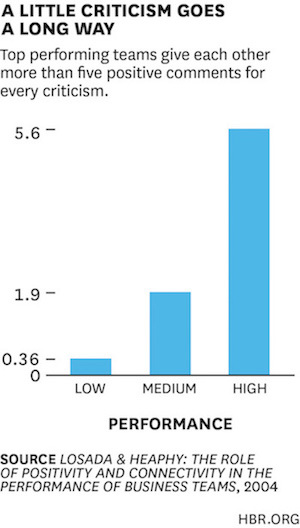 And this is all the more reason to avoid loss aversion as the basis for your rewarded ads. Losses, and negative actions around those losses like demanding a purchase or ad view, tend to drive players away and reduce purchase (or view) frequency. What you want, instead, is an action that can be repeated many times but doesn’t lose players—or, even better, makes players happy. Positive and negative rewards are one of the most studied aspects of human psychology, although usually in children. Since mobile game players are usually adults, studies on business psychology are most helpful. Consider a study on business teams covered in the Harvard Business Review: Criticism (the negative reinforcement) was found to have a place, but only remained effective when greatly counterbalanced by compliments (positive reinforcement). To respond to these lessons, mobile game developers should consider the ratio of positive and negative in their own titles. Putting a rewarded ad behind an instance of negative reinforcement in your game isn’t “bad,” per se—but it should be balanced by multiple instances of positive reinforcement, which is a type of operant conditioning (Learn more about operant conditioning in the context of rewarded video ad monetization). Or, negative reinforcement IAP can be balanced by positively reinforced ads. 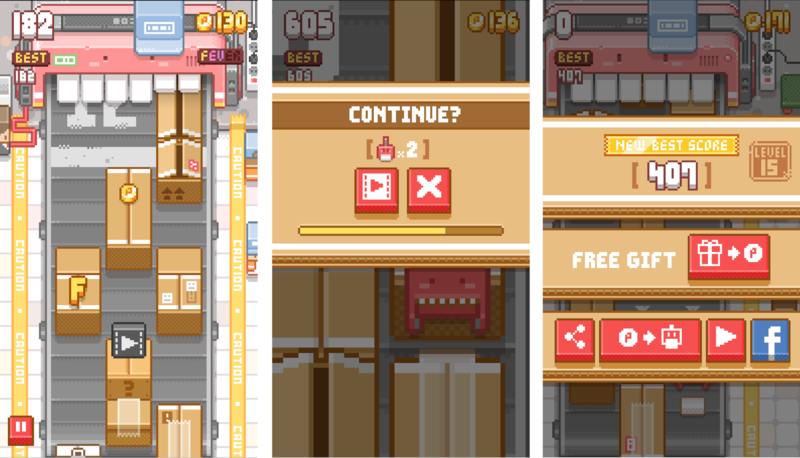 Several types of positive reinforcement are available to mobile game designers. When Crossy Road was released, most endless runners and stage-based games jammed mobile ads between sessions, forcing an ad view to get another life or go further. Crossy Road, instead, offers free coins for an ad view after a death, which can be ignored without any loss. 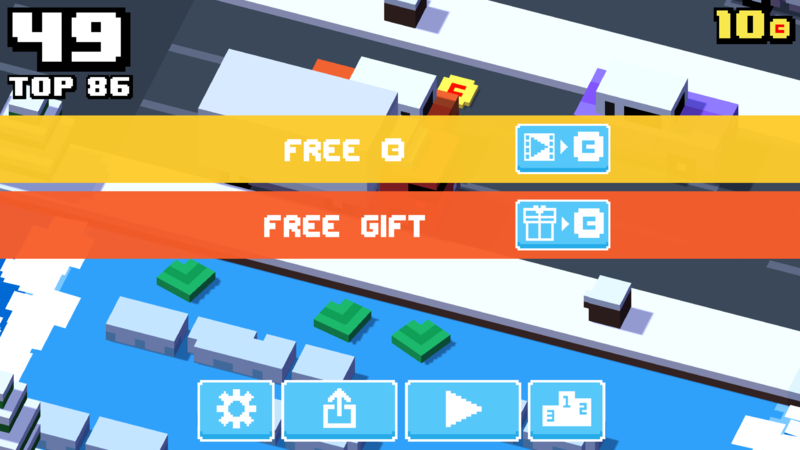 Crossy Road’s ads usually appear after a particularly good run—which supports the idea, introduced by ad network Kiip, that achievement moments are the best time to ask for something from the player. A Kiip study with IPG Media Lab shows 40% higher excitement in users after a moment of achievement. This excitement translates into more interaction—playing just one more stage, or watching your video ad. Randomly during a stage, after falling into an open box which may also provide a reward. After a death, to continue playing. After choosing not to continue, as a free coin reward. For other genres, even more positive ad monetization options are available. In our last story on rewarded ads, we showed that variable and fixed interval rewards create lasting ad-viewing habits. “Rewards” are obviously based on positive reinforcement, such as NimbleBit’s Bit City 2X earning multipliers. 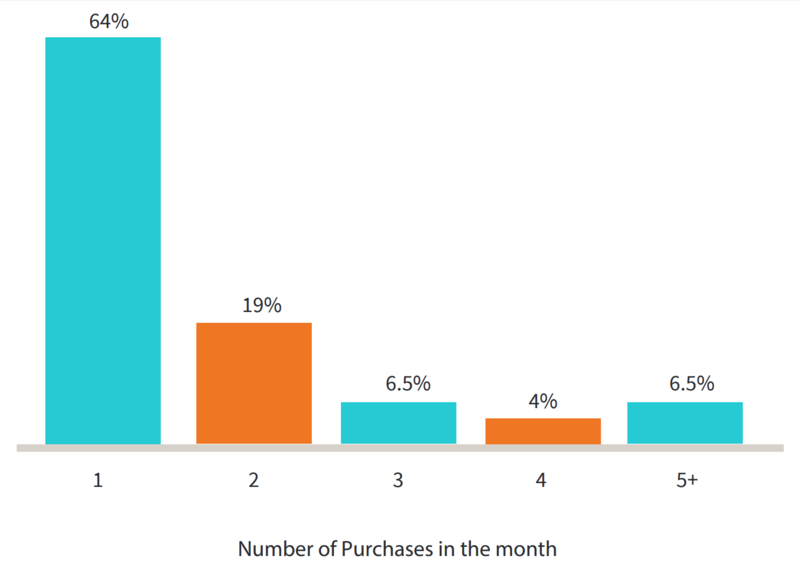 In fact, even IAP-based designers are finding out that positivity and rewards create the most powerful moments for purchase. Pay-to-loot systems, which ask the player for money to open a chest or card pack, hold so much power over user behavior that they’re increasingly viewed as problematic in the West (and have long been known for the same problems in China). But ad-based games don’t have to worry about asking players to view a rewarded video ad. No matter how many ads a player may view, they still never spend a dime—and hopefully, continue racking up rewards and positive reinforcement all the while.